When used in combination with high pressure sampling and a high pressure pump, live oil samples can be measured. In addition to acting as stand-alone test, the Model 1602 is also designed to be integrated with the Model 2370 Console, Model 2353 Flash Separator and the Model 2331D Gasometer to be part of a complete series of tests for determining the properties of reservoir fluids. The instrument is very easy to use. The pressurized sample is injected into the test chamber. A magnetic solenoid holds a steel ball at the top of its travel. When released, a highly accurate digital timer is automatically started as the ball rolls down through the sample. When the ball reaches the end of its travel, the timer is automatically stopped providing a precise falling time measurement. Viscosity values are then obtained by correlation of the falling time and ball diameter with curves of fluids with known viscosities and densities. 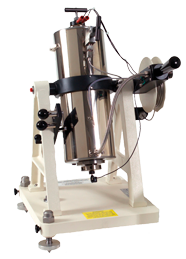 Three fixed roll angles are provided to facilitate testing a wide range of samples.